Macaulay Culkin and his band The Pizza Underground have been booed off stage at a concert in Nottingham. 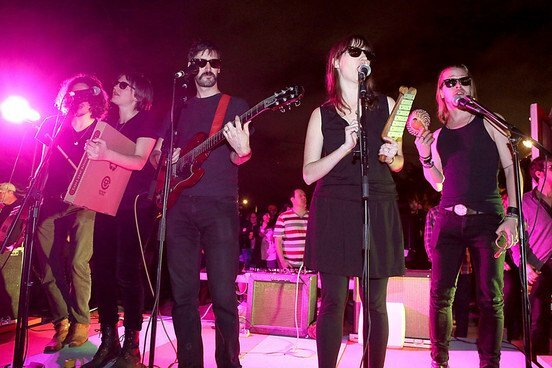 The group, who play Velvet Underground songs with pizza-themed lyrics and kazoo solos, also had pints of beer thrown at them. “Why are you throwing those?” Macaulay Culkin asked the crowd at the Rock City venue. According to reports, Macaulay Culkin’s band lasted only 15 minutes before being forced to flee the stage. “Thank you so much Nottingham,” The Pizza Underground tweeted later. The Pizza Underground show in Nottingham was part of the Dot to Dot festival – meaning audience members may not have known what to expect from the act. Macaulay Culkin, 33, is best known for his childhood role as Kevin McCallister in the Home Alone film series. He joined The Pizza Underground in 2012, performing parody songs such as Take a Bite of the Wild Slice (Lou Reed’s Walk on the Wild Side) and All The Pizza Parties (Velvet Underground’s All Tomorrow’s Parties). The quintet has a percussionist who plays a pizza box and they often hand out slices of pizza to their audience. The Pizza Underground met a similar reception on the Manchester leg of the festival, where pint glasses were again thrown and the gig ended abruptly after a stage invasion. The organizers of the Dot to Dot festival said: “It’s such a shame that some members of the crowd had to ruin what was set to be an excellent show. A sentiment echoed by the band themselves.